Architect: Page of Washington, D.C. Contractor: B.L. Harbert International of Birmingham, Alabama. The new $189 million campus is situated on an 8.8-acre site along one of the city’s main thoroughfares, Boulevard de la Marina, close to other diplomatic and ministerial buildings near the city center. 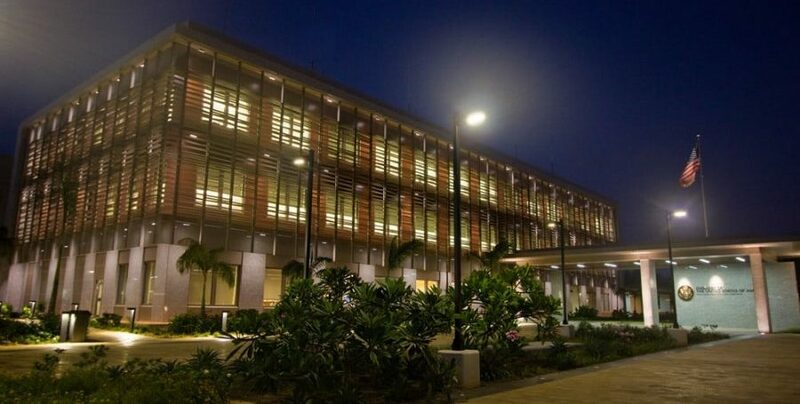 The compound includes an office building, Marine Security Guard residence, support annex, warehouse, utility building and other facilities for the embassy community. In addition to the architectural security enhancements, the building boasts a number of sustainable features to conserve resources and reduce operating costs including: photovoltaic panels, light-emitting diode (LED) site lighting, water-conserving plumbing fixtures, wastewater treatment and drought-tolerant landscaping. Ross custom designed and manufactured a wide variety of its Architectural Security Fenestration products in support of the Department of State’s Office of Overseas Building Operations security objectives.